It can be downright fascinating to watch the ebb and flow of certain movie trends. These days, we can’t go a summer without two or three superhero films smashing into theaters; some franchises thriving while other properties seek to gain footing. But for a long time, superheroes were largely absent from theater screens. A few piss poor made-for-TV film versions of some of the more recognizable Marvel characters were produced in the ’70s, as well as Batman, Wonder Woman, and The Hulk getting their own TV series, but it wasn’t until Christopher Reeve starred as Superman in 1978 that the idea of the big budget studio superhero movie came into prominence; Batman having his day in the multiplex a decade later. But then, shortly after the abysmal Batman & Robin, the studio superhero movie faded into the night. It wasn’t until Sam Raimi’s Spider-Man that the trend was rejuvenated…with a vengeance. With this latest surge of cinematic superhero appeal, droves of audiences are being awakened to the specifics — or sometimes even the existence — of characters that have existed in other media for decades. With the studio machine having gotten a firm grasp on the economic advantages of epic live-action superhero films, it’s as if we’ve reached a point where comic book heroes only exist to the general public if they’ve been embodied by movie stars in garish live-action blockbusters. We are but a little less than a week away from the release of Joss Whedon’s The Avengers, which I believe is the apex of this swing of the pendulum. The movie crams several larger-than-life heroes, most of whom have enjoyed their own major celluloid success story/stories, into one gargantuan live-action cinegasm. Yet years before Marvel put us all on the road to The Avengers, with the release of Iron Man, they were exploring the iconic superhero unit in an animated feature called Ultimate Avengers: The Movie. This 2006 flick centers on Captain America, a super soldier who, while thwarting a Nazi/extraterrestrial plot in 1945, is frozen in an icy tomb for sixty or so years. When he is thawed out, he is tasked with leading a team of heroes, assembled by General Nick Fury of S.H.I.E.L.D, against that same, resurrected, alien threat. This film not only served as a prelude for what we are slated to see in Whedon’s carbon-based Avengers film, but provides evidence that superhero movies don’t have to feature in-the-flesh actors to pack a punch. What makes this film so worth your time? For starters, you can put to rest any illusion that the movie (available currently on Netflix Watch Instantly) is for kids just because it happens to be animated. The intricate storytelling employed by Ultimate Avengers rivals that of most studio live-action hero epics. This is of course thanks to the fact that much of the film’s plot is based on the comic book series The Ultimates, which was also not necessarily written for really young children. I also like how they explore Dr. Banner’s ongoing tortured, Jekyll and Hyde relationship with his alter ego The Hulk, delving into his painful duality far better than Ang Lee’s Hulk. Ultimate Avengers also strikes a nice balance within its roster, giving each character equal screen time and spreading around the dramatic story points. 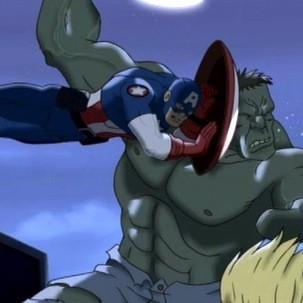 The action sequences in Ultimate Avengers are quite impressive. The opening sequence, in which Captain America leads the charge on a Nazi stronghold, is particularly thrilling, and surprisingly violent. One could make the argument that, though American soldiers are being shot and blow to smithereens by grenades, the lack of blood neuters the impact of this sequence. However, few theatrical live-action superhero flicks show blood and, as is often the case in those films, this scene is effective despite the absent gore. I also love the battle between the Hulk and the aliens, so kinetic and yet focused and visceral. These action sequences are aided in no small way by the film’s stellar animation, which is clean, starkly (no pun intended) detailed, and altogether masterful. There are elements of Ultimate Avengers: The Movie that, based on the marketing we’ve seen so far, will be echoed in the upcoming live-action film. The conceit of Captain America being the original Avenger, a super solider frozen in time, has already been explored by Joe Johnston’s Captain America: The First Avenger and carries through to Whedon’s movie. The animated film also features an alien threat, which seems to be at least part of Loki’s assault on our dimension in The Avengers based on the trailers. Also, several screen-grabs and set pics from The Avengers suggest a couple of side plots dealing with in-fighting between the members of the team; something also explored in Ultimate Avengers. 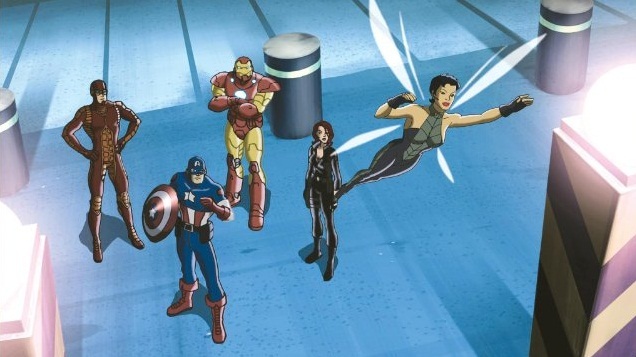 One thing that Ultimate Avengers boasts that the new movie doesn’t appear to be able to match is the inclusion of Avenger members Wasp and Giant Man, so you may want to give the animated movie a spin if for no other reason than to acquaint yourself with characters who may turn up in future blockbuster Avengers films. 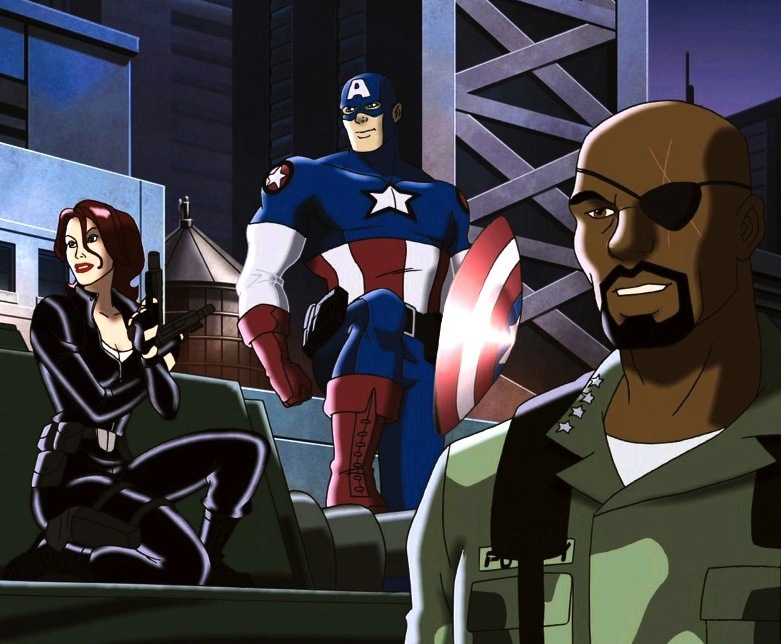 Interesting sidenote: in the comics, Nick Fury was originally Caucasian, but was changed to an African-American man in the Ultimate comic run. The new Fury was specifically designed to resemble Samuel L. Jackson years before he showed up in that Iron Man post-credit sequence. Chris Hemsworth Talks Avengers, Thor Sequel, and More!